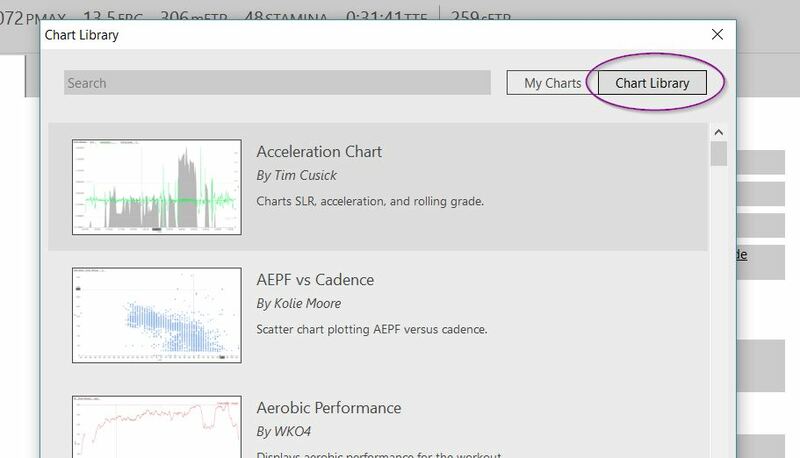 You may have noticed that if you open your data store folder (typically UserName>Documents>WKO4), there is a Chart Library folder within the main folder and a Charts folder within each athlete folder. The main Chart Library folder holds your master list of charts. You can't actually use a chart directly from the Chart Library folder, though; you have to check it out (using the Chart Picker within WKO4) to view it. When you open a chart from the Chart Picker, the program makes a copy of the chart, places it in that athlete's Charts folder, and adds it to the athlete's tab bar. When you make changes to that chart, they are applied to the athlete's copy only, and a dot appears in the title tab to indicate that the chart is now different from the version in the master Chart Library. This allows per-athlete customization of any chart without affecting the original chart or other athletes. When you close a chart, it's like checking it back in. If you didn't make any changes (no dot in the title tab), the copy is deleted and removed from the athlete's tab bar. The Chart Library remains unchanged. If you did make a change, however (a dot appears in the title tab), WKO4 will ask if you want to save the changes back to the Chart Library or discard the changes made. If you edit the original chart, rename it, and save changes, the renamed chart will be saved into your master Chart Library. The original version (with the original name) remains; if you want to discard the original chart, you'll need to go back and delete it separately. If you changed and accidentally saved a master chart that you wanted to preserve, all is well; open the Chart Picker, click on the "Chart Library" option at the top right, and re-download the original chart. You'll want to make sure you renamed your edited version, though, because downloading a chart with the same name will overwrite the existing one and your changes will be lost. Can I store my WKO4 data in the cloud? How can I export my Garmin Connect™ Activities into TrainingPeaks?